About 10 railway stations are burnt, 60 trains stopped, schools, police stations burnt, a private armory looted, curfew in 6 towns in Haryana, 8 dead, police, paramilitary, and Army called in to douse the flames. This is a snapshot of what is happening in the immediate vicinity of the National Capital Territory of Delhi for the past 2 days. EXPRESS PHOTO BY GAJENDRA YADAV 19 02 2016. Why is this happening ? A lot of simplistic comment is floating around the internet and in media op-eds. Almost all of them blaming the Jats for indulging in this kind of violence. Some of the commentators frown on the entire quota system and urge the Jats to be magnanimous and not seek the forbidden fruit. They dont realize that the quota system is a central part of the social and political system of organization known as the “Idea of India”. So its kind of odd that you’d call on a large group to sit outside the main political order. In reality, these commentators don’t want to be bothered with analysis of these issues and would wish the problem would go away. Here is a brief recap of the Jat quota issue just enough for you to follow the rest of this post. India provides explicit quotas to various groups of communities. The keyword is ‘group’ not ‘communities’. The largest such group is known as OBC – Other Backward Classes. Various discrete communities / castes are included in these groups, they are maintained as “Lists”. These Lists are maintained for each state – called State Lists, and a single list at the central level called a Central List. The idea is that for Central Govt slots (jobs, college seats, scholarships, central police forces, and a host of other opportunities) they would use the Central list and for State Govt slots they would use the State list. Now you may ask – ‘Well that is weird, how can a caste be in one list and not be in the other“. Hold that question for a moment, you will realize even such simple questions cant elicit an answer. Jats are in the state lists in a number of states like Rajasthan, Haryana, Delhi, UP, Bihar, HP, Uttarakhand and Gujarat. But they were not in the Central list. This meant they could only access the open category central govt slots and not access the large chunk of slots reserved exclusively for those in the Central OBC List. Due to sustained pressure and rioting. The UPA Govt included them in the Central List in March 2014. Not surprisingly, the other castes already in the central list would not have a new competitor and decide to fight the inclusion of Jats. Keep in mind that within each group (SC/ ST/ OBC) there is open competition among all castes in that list. Welfare associations representing the castes already in the Central List took it to the Supreme Court in a case called Ram Singh and Ors vs Union of India. A two judge bench of the Supreme Court struck down the UPA Govts notification and thus denied entry of Jats into the Central List. As things stand now, the quest is to balance the Jat aspirations with the persuasive qualities of the judgment. That is the brief recap of the genesis and current position of the Jat quota. Notice that I have not paid much attention to various govt bodies like NCBC and ICSSR etc. I believe these institutions are supposed to provide a check but the core rationale behind these institutions are missing. For that you have to go a bit deeper. First thing to notice is the name of the case. It is Ram Singh & Ors vs Union of India. This is a PIL case initiated by an umbrella group called the “OBC Reservation Raksha Samiti” presumably the gentleman Ram Singh was one of the petitioners.. The word “Raksha” in Hindi means protection. Protection against outsiders barging in to the group. This case is therefore the result of inside group resisting the outside group. This may not seem important but forms the core of the issue as we will see. So how does a caste get into the OBC list ? To answer that you have to refine that question. To get into a state OBC list you can petition the state govt and based on various considerations they may or may not grant that status. This is in fact where the major part of political effort is spent behind the scenes. For the procedure to get on to the Central list you have to go back to the 90’s. When reservation in Central Govt jobs was introduced as part of adopting the Mandal Commission recommendations the act was challenged. In an epic case called “Indira Sawhney & Ors vs Union of India“. The court upheld the quota and directed the govt to set up a body to examine claims of inclusion and exclusion. This body came to be known as the NCBC – National Commission for Backward Classes. The idea is that there would be robust tribunal that would scrutinize the entire program and could examine such claims with great authority. That turned out to be a disaster. The NCBC has not excluded a single group from the list nor has published any break up of utilization of each component. The entire exercise has a fatal flaw. The absence of ground rules. The lack of a single process or tests or even principles. The inability to state the conditions for initial entry into the list and whether the same process would apply to new entrants. On paper, the recommendation of NCBC is supposed to be binding on the govt. But the NCBC itself isnt doing its job because of lack of ground rules. See how everything is linked back to the original anomaly? The entire chain is based on an absurd premise that you can create these compact lists in a nation of thousands of claimants. Most of us can hold our nose at this and pretend that nothing is wrong. 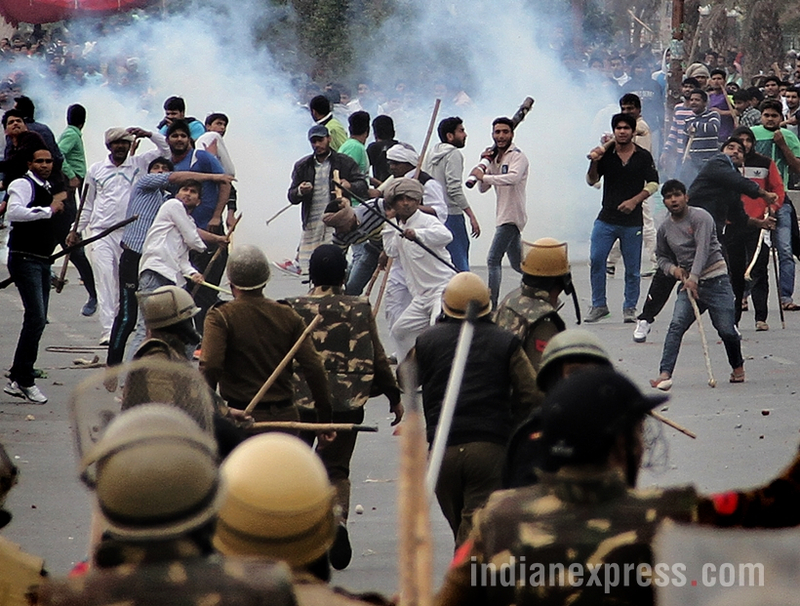 Until a dominant and organized group like the Jats decide to challenge this scheme of things. They demand answers, no answers, then they want in by force. If that is what it takes. The Gujjars, the Vanniars, have all shown the way. For those parroting the “Constitutional Method” let me give you the reality check. A constitutional method requires simple ground rules (first principles) that stand alone. It never works when a court seeks to resolve conflicts between two groups. For that you need a conflict. And that is what the Jats are giving you. Back to the Jat issue. In 2013, the Congress govt asked the NCBC for an opinion they said ‘no way’ without any convincing data. The Govt decided to go ahead and announce the inclusion of Jats anyway. Now this is the state of affairs as the case lands in the lap of a 2-judge bench of Justice Rohinton Nariman and Justice Ranjan Gogoi. The judgment examines a lot of issues – particularly the powers of NCBC, the method used by ICSSR (the social agency which conducted a study), and some available data. They ruled against inclusion of Jats in the list on the following reasoning. The perception of a self-proclaimed socially backward class of citizens or even the perception of the “advanced classes” as to the social status of the “less fortunates” cannot continue to be a constitutionally permissible yardstick for determination of backwardness, both in the context of Articles 15(4) and 16(4) of the Constitution. Neither can any longer backwardness be a matter of determination on the basis of mathematical formulae evolved by taking into account social, economic and educational indicators. Determination of backwardness must also cease to be relative; possible wrong inclusions cannot be the basis for further inclusions but the gates would be opened only to permit entry of the most distressed. Any other inclusion would be a serious abdication of the constitutional duty of the State. Judged by the aforesaid standards we must hold that inclusion of the politically organized classes (such as Jats) in the list of backward classes mainly, if not solely, on the basis that on same parameters other groups who have fared better have been so included cannot be affirmed. Put simply, what the bench is saying is. “The party is over folks, you cant get in merely because others have got in and they may be better positioned than you“. This is akin to pulling up the ladder after a certain number of groups have acquired the ‘inside’ status. Do we really think a large organized community like Jats (or Marathas or Kapus) will accept this line of reasoning ? The judgment went on to say that it prefers discovery of new backward classes like the Transgenders who cut across castes. This part of the judgment was celebrated in the media. I fail to see why Transgenders should be given any quota. Accommodation yes, quota no. In my view, the judgment is fatally flawed on the following point “Determination of backwardness must also cease to be relative; possible wrong inclusions cannot be the basis for further inclusions” I would go a step further and state that the protests currently happening in Haryana turn on the moral unacceptability of this logic. The judgment actually does a remarkable job summarizing the relative positions of Jats, Ahirs, Yadavs, and Kurmis. Reading the initial parts of the judgment you get the feeling like they are finally about to take the bull by the horns.. consider these factoids. After collating all this relative information, the judgment completely disappoints.The honorable judges dismiss the comparative data completely as of no relevance. The question framed should not have been whether the proper procedure was followed in declaring Jats backward. Whether the NCBC rejection was binding and surrounding issues. The question in my view should have been framed as an Article 14 issue – as an ‘equal protection’ case. The above sentence is the much mutilated Article 14 (equality) clause in the Indian constitution. Now I fully understand that the Indian constitution has juxtaposed “Idea of India” doctrine as an exception to “Rule of Law“. Remember that the central proposition in Rule of Law is uniform application and that the central feature of Idea of India is to create separate processes for groups. Even if this is the case, the equal protection clause must guarantee that every community has the same process to get into the exception category. I repeat that – its not that you cant pick out groups for separate treatment but the process used to pick out groups for such treatment must be uniform. Now turn to the facts of the OBC lists – the Idea of India jurisprudence has split the population into “Inside groups” (those already included in the list) and “Outside groups” those wanting to get into the list. The biggest problem is that those who are already inside did not go through the same process of measurement that the outsiders are being subject to. This is a gigantic anomaly that cant be brushed aside. This is especially important in a ‘game of spoils’ where there is no stigma to call your self anything as long as there are special and exclusive goods to be had. Once you cast (no pun) the question as one of equal protection – it is clear that the Jats are being asked to come through a very highly fortified front door while there are others who are inside on much looser criteria through the back door. Also the revisions to the lists are not happening even in boundary conditions like Tamilnadu. This only means that inside group members seem to be permanently immune from scrutiny and even quantifiable relative data to outside groups now will not be accepted. My view is exactly 180-degrees from the judgment. The inclusion and exclusion issues must be purely relative. There cannot be any absolute measure of backwardness because remember that within the OBC group there is a pure meritocracy. The “List” ought to be the central subject of all litigation and the main job of the statutory body and the judicial review process is to preserve the integrity of the list. All it should take for Group-A to declare the entire list invalid is to show that there is atleast one Inside Group that is better off than atleast one Outside Group. At the state level, things are totally absurd. I have proved that in Tamilnadu the situation is out of control. There are no students from the open category getting through PG Medical Tamilnadu Seats in top colleges. It is also important to not expand the domain where the quotas can be asserted. Especially dangerous is local body quota which distorts the entire democratic process itself. Another live wire is sectarian spending such as group wise scholarships, special schools and vocational training only for some groups, special financing, and such like. One of the dismaying phenom in India is the following : The establishment try some mad-scientist experiments with the Rule of Law (which evolved in the west as an outcome of centuries of bloodshed) , the experiment doesnt work, so they drop some assumptions and open an entirely new can of worms. In the previous regime, if there were 8 people who could wrap their heads around the issues, when you drop down a level and open a can of worms only 4 can handle it. This has been going on for too long. Now no one seems to have control of the situation. Some new can of worms ready to be opened are. Can all states be like Tamilnadu ? Declare 90-95% as backward ? Can all groups (castes/religions) be given a pro-rata allocation ? Remember this was the issue in Champakam Dorairajan vs Union of India that prompted the first amendment. Stunning we want to go back to the Communal G.O in Madras Presidency after 70 years of Independence. In any invidious law ; the people always measure their impact with respect to other people. If a Jat aspirant loses a bank job, it is someone else who gets it. This is the source of the tension and only a relative test can soothe it. Truly a crisis situation. Only next to the rot in our education laws. Thanks for a very factual and eye-opening article. We need more writers like you. Please keep writing. Not surprisingly, the other castes already in the central list would not have a new competitor and decide to fight the inclusion of Jats. Should it not read “now” instead of “not”? The meaning changes significantly!